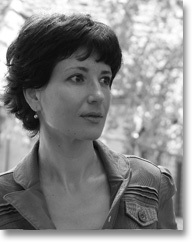 Kapka Kassabova is the author of the poetry collections Someone else’s life (Bloodaxe) and Geography for the Lost (Bloodaxe). Her travel memoir about growing up under Communism and post-Communist Bulgaria, Street Without a Name (Portobello) was named book of the year by Jan Morris in the Financial Times and short-listed for the Dolmann Travel Book of the Year Award and the 2009 Prix Europeen du livre. She writes for the Sunday Times, The Guardian, the TLS and Vogue. She is a Royal Literary Fellow at Strathclyde University and lives in Edinburgh because of its tropical weather.